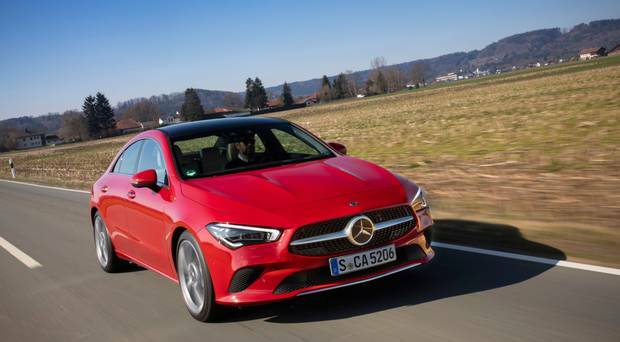 The new compact CLA 4dr Coupe from Mercedes gets to Ireland next month and, I reckon, will cost from around €34,000 for the petrol manual and €36,000 or so for the diesel. Its launch marks the start of a wave of new, and facelifted, models from the brand this year. The CLA slots between the A-Class (on whose platform it is built) and the C-Class saloon. Pricing strategy will keep distance between the three. So the A-Class start of under/around €30,000 leaves daylight to the CLA (say €34,000?) and again to the C-Class (close to €40,000). In reality all will cost more; people want better-specced models. Officially Mercedes are not commenting but I’d expect them to say my CLA ‘guess price’ would be a modest increase considering it is such a bigger, better car all round. It is wonderful looking now (the old one wasn’t bad, in fairness). The front gets the tasty Merc treatment of diamond patterned grille and central star; the side is smooth over a stretched crescent roofline while the flanks/rear get most change. The roof and rear pillar stretch further backwards to fold into a rounded boot, reminiscent of the C-Class Coupe. 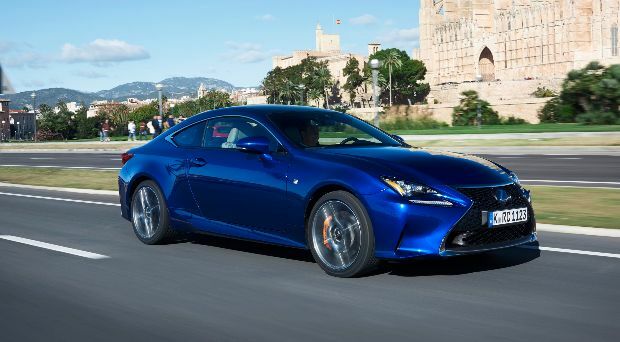 It’s a bigger car than the current model (six years on the go) and is stylistically better balanced thanks to that flowing side and rear wrap. The cabin is, without doubt, the best in class. Our test car’s interior caught the eye with its twin-screen display and large circular ventilation outlets. No doubt the twin screens and other items will be extra, or on top-spec models, but it might be worth stretching for them if you can. The infotainment system, in particular, is hugely attractive (displays navigation, augmented reality aids, voice activated controls). It also has software that picks up on what the driver wants (well sometimes only because my experiments were not 100pc successful). That MBUX user experience system and voice-activated ‘Hey Mercedes’ driver assistance facility are standard. New functions for MBUX include taking instructions to adjust seats, operate reading, and interior, lights. There are several driver assistance elements too as stuff trickles down from the S-Class. For example, the CLA can drive semi-autonomously in certain situations. From launch there will be a strong line-up of petrols and diesels. They expect the CLA 180 petrol and CLA 180d to be jointly most popular. Standard safety items include enhanced Brake Assist, emergency stop, lane change assist etc. Also standard are halogen headlamps with integrated LED daytime driving lights. The new car is 48mm longer, 53mm wider (wheelbase up 30mm) and 2mm lower than before. They claim the lower centre of gravity and wider track (up 63mm front, 55mm rear) give it the “sportiest driving characteristics of all models in the new generation of Mercedes compacts”. I have just been at the wheel, but I had to sign a driving impressions embargo until next week so I can’t comment. But take a good look at the smaller petrols and you won’t go far wrong. They also claim the multi-link rear axle reduces noise, vibration and body roll due to a larger diameter stabiliser bar. A direct-steer system is standard while an active adaptive damping system is optional. Driving impressions next week. 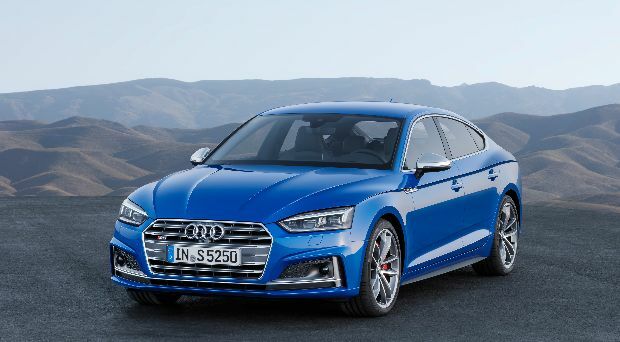 The stylish Audi A5 comes in coupe, cabriolet and hatchback form. Handsome coupe here to upset the established brands. An individualistic option in a repetitious market place. 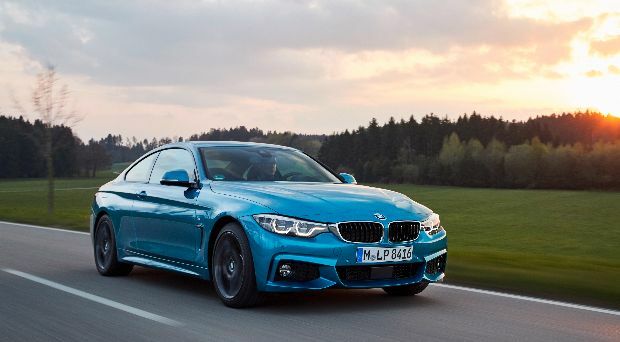 A good-looking coupe with world class driving dynamics, fantastic interiors and a broad range of engines. 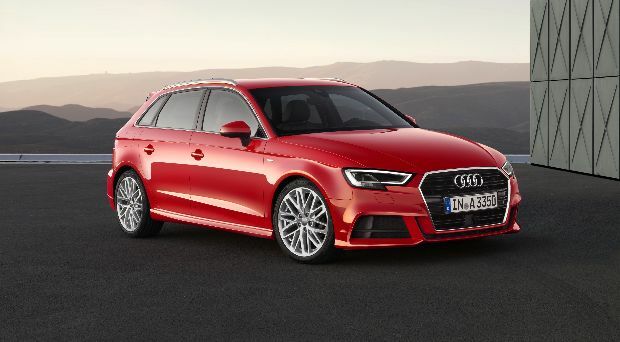 The well-built and practical Audi A3 is a great all-rounder with a premium feel.